On August 21, 2002, New Mission News editor Victor Miller died of a heart attack at age 54. His passing has left a terrible void in media coverage of the Mission District, which no print or online publication has filled. 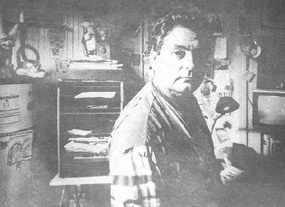 Miller provided the most perceptive and trustworthy insights about the Mission District from the early 1980’s to his death, and the neighborhood has not recovered from his passing. For nearly two decades, Victor Miller was the best neighborhood editor/ journalist in San Francisco. He was a throwback to the days when a single person with vision and writing skills could put together an entire newspaper, even arranging its distribution and selling advertisements. The great advantage Miller had over other journalists was that he was a core member of the Mission community, not an outsider. He knew the personal and political histories of neighborhood leaders and his coverage reflected a depth of understanding that others covering the scene could not touch. Miller also had another key edge—he loved the Mission District and always put the neighborhood’s interests first. He did this even if that meant alienating an advertiser or causing a rift with an individual or group active in the community. With Miller always on the scene and in the know, those seeking to harm the neighborhood knew that there would be at least one media outlet holding them accountable. And since Miller had the best sources, he broke nearly all the big Mission stories. When activists fought to improve housing code enforcement for the Mission’s Latino families, Miller provided front-page stories with graphic photos of falling ceilings and kids standing by the stove for heat. We used to time our media events so that Miller would get the story just as his paper was going to press, since we knew that he would provide the most comprehensive coverage. The list of issues that Miller brought to public attention is too lengthy to list, but his impact can be seen from the following examples. Every time a new proposal was developed for the Mission Armory, Miller was there to puncture the hot air and address the realities of what was proposed. Once subjected to Miller’s careful economic analysis, every plan looked faulty—and when the latest feasibility study or project fell short, Miller was again proved right. When the Cort family, landlord of the office building at 22nd and Mission, displace all its non-profit tenants, Miller was on top of the story. He did a series of pieces on the dot-com upstart Bigstep, which planned to take over the entire structure. Miller’s exposure of Bigstep’s move led the company to slow its expansion plans, and it appears to now be defunct (its website is well out of date). Non-profits have returned to 22nd and Mission, a turn of events Victor would have appreciated. The Mission is home to many nonprofit groups, and Miller always maintained a healthy skepticism as to how some of them spent their money. He covered the controversies surrounding the dissolution of two once prominent Mission nonprofits, the Real Alternatives Program (RAP) and Mission Community Legal Defense (MCLD). He had ongoing coverage of the nonprofit Mission language program that owned a building at 16th and Valencia and was the proverbial landlord from hell for its commercial tenants. Miller saw himself as a small business person, and was active in the Mission Merchants Association. He was openly pro-business, so long as that business was good for the neighborhood. Miller provided the most insightful coverage of the controversy over a flower stand that opened without a permit, led the fight to close down the former operators of a bar/drug hangout, Dot’s Clock, and pushed for the proposed new City College campus on Mission Street. The City College fight showed the essence of Miller’s agenda. He was outraged that a handful of Caucasian self-proclaimed preservationists would try to derail the building of a Mission campus desperately desired and needed by Latino residents. The movie theater sought to be “preserved” had long been closed, yet City College leaders were giving the small band of opponents credibility beyond their numbers. Miller saw this as a classic case of a white middle-class minority getting better treatment than low-income Latinos. He lost this battle (the proposed campus was relocated) but succeeded in exposing the truth. Miller saw the dot-com boom as potentially gentrifying the neighborhood, but did not share the anti-development politics of some Mission activists. He also was a strong advocate of anti-crime efforts, and led the fight to rehabilitate the 16th Street Bart Plaza (whose renovation he would not live to see). Since Miller’s tragic and untimely death, the stories he covered so diligently have been left largely unreported. The New Mission News has tried to go on, but Miller was the engine that drove the enterprise. This has left a huge information void about Mission District affairs. The Mission rezoning that activists fought so hard to achieve is still not completed even though the Board of Supervisors has allocated money for the study to the Planning Department three times. This is the type of story that Miller and the News would have raised hell about, and had he been around the rezoning study would likely already be completed. When Mission Housing Development Corporation (MHDC) went through an upheaval that saw its Executive Director fired and the staff at war with the Board, Miller’s historical perspective and clear analysis was desperately missed. The events and causes surrounding MHDC remain unclear, and Miller would not only have provided such clarity, but would have assessed the impact of the dispute on the group’s future. The list of what we don’t know and don’t clearly understand because Miller is not around to explain it all to us is ever growing. He provided the voice that every neighborhood desperately needs. Miller’s uncompromising allegiance to the truth led him, as the masthead of the News said, to “afflict the comfortable and comfort the afflicted.” But even those he criticized respected him, for they knew he was guided not by money or power but by his vision of the truth. I used to tell Victor that he was indispensable. I wish I had been wrong.